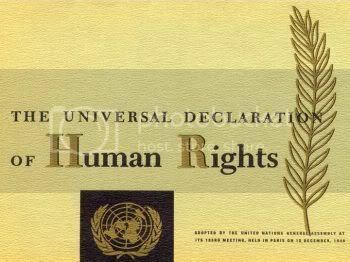 Partial acceptance of UNDHR defeats purpose of universal declaration in the first place. By Alastair Su. During the ASEAN summit two weekends ago, while leaders exchanged assurances of economic cooperation, one issue was left ambiguous: that of human rights. Many had expectations that a human rights committee, an issue long neglected by ASEAN, would finally be established this year. Sadly, no consensus was reached and no such committee was formed. What this reveals is simple. While the concept of human rights is something deeply embedded in the Western psyche, in the Asian and the Singaporean mind, a deficit still exists in our thinking – thus explaining ASEAN’s inability to form an effective human rights group. To many, the whole idea of human rights still remains a very alien, Westernised idea. During the Burmese riots in 2007 for example, only two groups of people participated in the rallies held here: Burmese, and sympathetic caucasians. Meanwhile, Singaporeans stayed at home, indifferent towards the numerous accounts of human rights abuses, at best following the events only on TV. However, to simply typify this as a case of Singaporean apathy overlooks a larger, more pressing problem. The reason why Singaporeans were not affected by events in Burma was not due to a cold feeling of aloofness or indifference, but plain ignorance. If questioned, most Singaporeans would not be able to tell you what human rights are, even at a basic level. I shamefully confess that I’m part of this list – in the midst of preparing this article, I had to actually google the term “human rights” to make up for my ignorance! While the origin of human rights goes back many centuries, its defining moment would probably be the Universal Declaration of Human Rights in 1948, where global leaders gathered to formalise human rights and its definitions. In general, it spans five broad areas – political, civil, economic, social and cultural, prohibiting practices like torture, political censorship, and condemning things like poverty and gender inequality. Since then, its principles have been enshrined in countries like the US, members of the European Union, as well as international bodies like the United Nations and OXFAM. Critics will of course point out that such countries that profess to follow human rights have often displayed hypocritical behaviour, naming examples like Guantanamo Bay and controversial extradition laws, though one can safely argue that such breaches make the exception – and not the rule – in these countries. Meanwhile though, the recognition of human rights in Singapore remains virtually non-existent. In my 12 years of education here, not once was the topic of human rights raised during any of my national education lessons, a clear omission in education policy on our government’s part. This has in turn led to many generations of Singaporeans raised without a single notion of what human rights really is, and the significance it has for our lives. Yet, before we go headlong into how this issue needs to be dealt, it is also appropriate to take a step back and consider an important question. Anticipating what would likely be our government’s response, we need to ask ourselves this: to what extent is the whole concept of human rights merely a Western thing? While it was called the Universal Declaration of Human Rights, remember that it was mainly Western minds and hands that conceived and penned that declaration almost sixty years ago. Given Singapore’s and Asia’s profoundly different history, culture and psyche, would it be an error to simply import wholesale what may be a foreign set of ideals? For those in favour of a compromise solution, or an Asian version of human rights if you will, understand there is no such thing as a selective interpretation of human rights, where we import the parts that seem expedient to us – something our government may be tempted to do. Either we take the whole package or leave it; partial acceptance defeats the whole purpose of having drafted a universal declaration in the first place. Ultimately, the answer to this question is by no means straightforward, it is something we must consider seriously as a citizens of this country. Tarrying with this issue will only prolong the formation of an effective human rights body here – maintaining Singapore’s status as a place that is economically a first-world country, but politically as developed as the sleepy colony we were before a certain party took power.